This slim functional upright profile makes it the ideal choice wherever books, files and records of any type are stored. With accessories such as file rails, dividers or bin fronts it can be easily adapted to the wide ranging needs of offices, hospitals, banks and other commercial institutions. 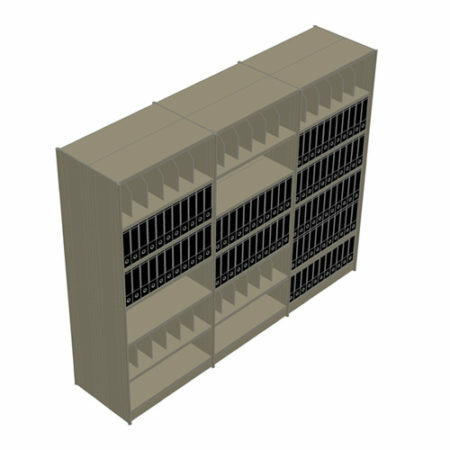 At the heart of the system is the slim rolled profile of the front upright of the shelving bay. It gives strength and stability to the rack whilst allowing easy uninhibited access to the items stored on the shelf. Adjustable holes are positioned at 25mm intervals in the height of the frame so that shelves can be precisely positioned to maximise the use of available space. Backs of racks can be open for economy or solid clad where small items are stored. Brochure: Please download our full brochure or view the product from the link below.